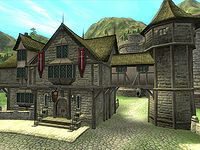 Chorrol Fighters Guild is on the west side of Great Oak Place in Chorrol, between the Mages Guild and Rimalus Bruiant's house. The building is divided into Fighters Guild, Chorrol Fighters Guild Tower, and Chorrol Fighters Guild Basement. 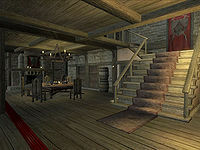 The entrance to the Chorrol Fighters Guild is across from a set of stairs leading up. To the right, an iron claymore and warhammer sit on a weapons rack. On the table next to it are a green silk garment, a blue silk shirt, a Highwayman's shirt, and a potion of Night Eye. On top of a copy of Report: Disaster at Ionith lies a copper ring. The two smaller display cases on this same wall, as well as the larger one in the alcove, are locked with hard locks. The first holds a copy of Fighters Guild History, 1st Ed., the second is empty while the third one holds a Dwarven war axe replica. The weapons rack to the left of the front door holds two iron daggers. The chest next to it contains clutter, and an iron longsword sits on top of it. The chest next to the stairs also holds clutter, and two iron bows are on top of it. Three bags of flour lie next to it. The door behind this chest leads to the Basement. A large round table in the middle of the first level seats five. On plates are four samples of ginseng, a stinkhorn cap, four ironwood nuts, two muttons and one onion. A bottle of cheap wine and a bottle of Tamika's West Weald Wine also sit on the table. Two barrels stacked between two doors on the north wall can hold clutter and/or a repair hammer. On the wine rack in the southwest corner are seven bottles of cheap wine, nine bottles of Surilie Brothers Wine, and sixteen bottles of Tamika's West Weald Wine. The two doors between the barrels and the keg lead out the back of the building, to Chorrol. On the second level, three single beds face the stairs. The chests at the foot of each contain only clutter. The door on the east wall here leads to the Fighters Guild Tower. In the west end of this level, another two single beds are against the wall with another two clutter chests at the foot of each. The bookshelf beside the southern bed holds a bottle of cheap wine, as does the bookshelf next to the other bed. The stairs here lead up to a loft office. The desk in the middle of this level contains clutter and up to three random books. On top of the desk sit two bottles of ale. The two large display cases behind the desk are both locked with hard locks. The one on the left holds a glass longsword replica, and the one on the right holds an elven long sword replica. The chest between them is where rewards are placed once the player has become Master of the Fighters Guild. The cupboard in the north corner contains clothing, and the counter on the northwest wall contains clutter. The bookshelf on the opposite wall holds a copy of The Old Ways, and the weapons rack next to the balcony rails holds two fine steel longswords and a silver shortsword. None of the containers on the first, second, or third floors are safe for long-term storage. 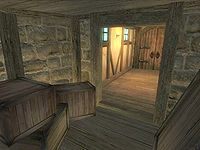 Upon entering the Tower, at the end of a short hallway is a round room with four crates, all of which contain clutter and/or a repair hammer, and trap doors to both the lower and upper levels. On the lower level are another three clutter/repair hammer crates and seven barrels with the same contents. Six tied sacks here contain clutter, while the two untied sacks contain food. The sacks do not respawn. 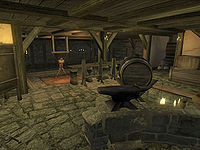 On the upper level are two empty weapons racks and three chests; the middle one contains clutter and a copy of the heavy armor skill book Hallgerd's Tale. The chest on the left contains gold, jewelry, and clutter, and the one on the right contains armor and weapons. Although the chest in the middle does respawn, the ones on the left and right do not. The stairs down into the basement lead into a forge area where Sabine Laul can often be found. The side-by-side weapons racks next to the forge hold four iron longwords and three iron daggers. A fourth iron dagger can be found on the floor near the anvil with the calipers on top. The two weapons racks against the balcony rail hold two iron warhammers and an iron claymore. The cupboard next to them holds clutter. 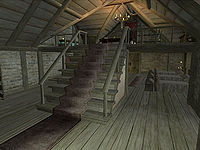 An alcove under the stairs holds five sacks, two barrels, and a crate, all containing clutter. The sacks are the only containers in the basement that do not respawn and so are safe for long-term storage. In the center of the lower level is a training dummy. The cabinet on the north wall contains clothing, as does the one on the south wall. A barrel in the southwest corner contains clutter and/or a repair hammer, and a bedroll is on the floor next to it, and a repair hammer behind it. The two chests side-by-side on the west wall contain clutter. This page was last modified on 13 October 2018, at 09:42.